During pregnancy women get bombarded with food and nutrition information. Eat this, don’t eat that! It gets very confusing. Recent debates about the role of carbohydrates have cranked the confusion up a notch. In pregnancy, women need nutrient-rich sources of carbohydrate, in the right amounts. Carbohydrate is a macronutrient that your body uses as a source of fuel for muscles and organs like the heart, lungs and brain. Out of the three major macronutrients found in food (protein, fat and carbohydrate), carbohydrates have the biggest impact on short-term blood glucose levels. When foods containing carbohydrates are eaten, they are broken down into smaller units in the small intestine using enzymes found in saliva, the small intestine and the pancreas. Next, the hormone insulin is released into the bloodstream to help move glucose from the blood into our cells, causing blood glucose (or blood sugar) levels to rise. Foods contain varying amounts of carbohydrate. Rich sources include starchy vegetables (potatoes, sweet potatoes, corn), bread, pasta, rice and fruit. Foods containing carbohydrate in smaller amounts include milk, yoghurt and legumes such as kidney beans. These foods all include nutrients that are important for everyday health, such as dietary fibre and B vitamins. Foods that are high in refined carbohydrates, particularly added sugars are called energy-dense, nutrient-poor, non-core or discretionary foods. These include soft drink, ice cream, lollies, cakes, biscuits and pastries. Ideally, these should only be eaten occasionally, meaning once a week to once a month or less often. Alarmingly, in the 2011-2012 Australian Health Survey 35% of Australian’s total daily energy was found to come from discretionary foods and beverages. 2. Why are carbohydrates important during pregnancy? During pregnancy, metabolic adaptations occur that allow the mother to meet her own nutritional needs, as well as those of the developing baby. These normal adaptations, as well as weight gain during pregnancy, impact on maternal glucose and insulin metabolism. 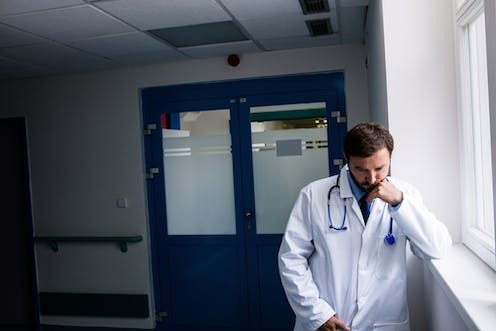 These changes mean a pregnant woman is more likely to have high blood glucose levels (hyperglycemia) and more likely to have impaired regulation of blood glucose levels, which could lead to the development of gestational diabetes mellitus. 3. What are the consequences of high blood glucose levels during pregnancy? High blood glucose levels during pregnancy are associated with an increased risk of the mother developing gestational diabetes during pregnancy and then type 2 diabetes in the future. It also increases the risk of pregnancy and birth complications for both the mother and baby, such as primary caesarean delivery and infant hypoglycaemia (low blood glucose levels) immediately post-birth, as well as premature delivery, shoulder dystocia and pre-eclampsia. High blood glucose levels in pregnancy are most commonly linked to gestational diabetes. However, blood glucose levels that are slightly elevated, although not high enough to be diagnosed as having gestational diabetes are associated with a higher risk of some, but not all adverse health outcomes. Blood glucose levels within the diagnostic gestational diabetes range have been found to be independently associated with the offspring’s risk of abnormal glucose tolerance, obesity and higher blood pressure at seven years of age. Therefore avoiding excessive high blood glucose levels in pregnancy has the potential to optimise the baby’s health in later life. 4. Should I avoid carbohydrates during pregnancy? No! Carbohydrates should definitely not be avoided during pregnancy. Other nutrients important for pregnancy that are limited in the Australian food supply, folate and iodine, are added to bread-making flour. Both of these nutrients are needed more during pregnancy. Folate helps protect again neural tube defects in the developing foetus and iodine is needed for the production of the thyroid hormone, which plays an important role in growth and development. Following the mandatory fortification of bread with folate and iodine in Australia in 2009, there has been a significant overall decrease (14.4%) in the rate of neural tube defects. Folate is also found in a range of other foods including vegetables (asparagus, spinach, broccoli), chick peas and bran flakes and iodine is found in seafood, eggs, meat and dairy products. The key thing to consider when choosing foods that contain carbohydrates is the quality and the quantity eaten. 5. Are all carbs of equal value? No! Carbohydrates are present in a wide variety of foods and these vary greatly in nutritional quality. High-nutritional quality carbohydrate containing foods are generally nutrient-dense “core” foods that belong to the basic food groups within the Australian Guide to Healthy Eating. This includes grains/cereal, vegetable, fruit and dairy food groups. Examples of high-nutritional quality carbohydrate foods include wholegrain breads, sweet potato, kidney beans, fresh fruit and yoghurt. Low-quality carbohydrate foods are generally in the discretionary foods list. Examples of low-quality carbohydrate containing foods include cakes, biscuits and lollies. If you’re eating mainly high-quality carbohydrates and limiting your intake of low-quality carbohydrates, then you have taken the first step to managing your blood sugar levels and boosting your fibre and nutrient intakes, as well as your overall health. 6. If I eat the ‘right’ type of carbohydrate, can I eat as much as I like? No! Carbohydrates have a direct impact on blood glucose levels and the portion size, which is the amount eaten in one meal or snack, has a big impact on your blood glucose. Spreading your intake of carbohydrate foods throughout the day and consuming appropriate portion sizes is important in managing blood glucose levels. The Australian Guide to Healthy Eating can help you to identify what one standard serve size of various carbohydrate containing foods looks like in order to better manage your portion sizes. Carbohydrate foods are also digested at different rates; some slower and some faster than others. The Glycaemic Index (GI) is a relative ranking of carbohydrate foods according to how quickly your blood sugar rises after eating a standard amount. Lower GI foods (a GI value of 55 or less) are digested more slowly and therefore result in a slower rise in blood glucose levels compared to foods with a higher GI value. Low GI foods include grain and seed breads, legumes and reduced fat milk. High GI foods include white bread and short-grain white rice. 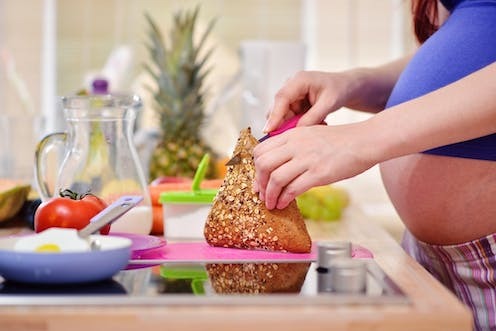 Carbohydrates are not something to be feared during pregnancy. Include a range of healthy core foods, including nutrient rich sources of carbohydrate, but be mindful of the types of carbohydrate foods and the portions size eaten. If you are pregnant and would like to learn more about healthy eating and carbohydrate intake in pregnancy, take part in our Australia-wide nutrition study. Clare Collins is affiliated with the Priority Research Centre for Physical Activity and Nutrition, the University of Newcastle, NSW. She is an NHMRC Senior Research and Gladys M Brawn Research Fellow. She has received research grants from NHMRC, ARC, Hunter Medical Research Institute, Meat and Livestock Australia, Diabetes Australia, Heart Foundation. She has consulted to SHINE Australia, Novo Nordisk, Quality Bakers and the Sax Institute. She was a team member conducting the systematic reviews to inform the 2013 revision of the Australian Dietary Guidelines and the 2017 evidence review on dietary patterns and heart disease for the Heart Foundation. Hannah May Brown is affiliated with the Priority Research Centre for Physical Activity and Nutrition, the University of Newcastle (UoN), NSW. She is a PhD candidate and research assistant and is a member of the Dietitian’s Association of Australia. Hannah’s PhD is supported by a Post-Graduate Research Scholarship from the University of Newcastle and The Neville Eric Sansom Scholarship. Megan Rollo has received research funding from a number of bodies including Diabetes Australia, Hunter Medical Research Institute, New South Wales Government (TechVoucher) and Novo Nordisk, and consulted to the Sax Institute and Quality Bakers Australia Pty Limited. She is affiliated with the Priority Research Centre in Physical Activity and Nutrition at the University of Newcastle and a member of professional organisations including the Dietitians Association of Australia. Tamara Bucher is affiliated with the Priority Research Center for Physical Activity and Nutrition, the University of Newcastle Australia, NSW and the Consumer Behavior Research Group at ETH Zürich, Switzerland. She has received a range of research grants including the Swiss National Science Foundation (SNSF) and the Swiss Foundation of Nutrition Research (SFEFS) and the European Union (Horizon 2020).